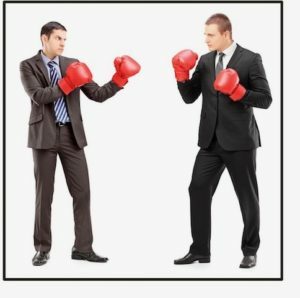 Countersuits – An Unexpected Counterpunch! - Credit Mediators Inc.
As many of you already know, the last step in the collection process on a commercial delinquency is the filing of a suit against the debtor, especially when the balance due is large and there remains some viability of collecting. Although every effort is taken to avoid this step, it’s one of the only legal ways to ultimately compel a debtor to pay. Upon being sued, one of the unexpected responses that a debtor may pursue is to hire an attorney and file a counterclaim (countersuit and counterclaim will be used interchangeably in this article). There are many legitimate reasons why a debtor may countersue, but in my experience most countersuits are based upon unsubstantiated claims as a strategy to maneuver out of the original debt obligation. Regardless of the motive a debtor has to file a counterclaim, the creditor’s attorney must now defend the creditor. When this happens, the attorney will often require a retainer and usually charge their normal hourly fee. What can creditors do to help minimize the possibility and/or impact of a counterclaim? In addition, all supporting documentation such as purchases orders, invoices, shipping documents, and any other forms that are used in a transaction should be carefully reviewed by your legal counsel to confirm consistency of terms and conditions, and to minimize areas of confusion or misinterpretation. Since the creditor’s documentation was legally very tight and no such contractual breach ever occurred, they decided to fight the debtor’s countersuit. The result was that prior to the court date, the debtor dropped their countersuit, and not only paid the creditor’s account in full, but attorneys fees as well. The countersuit was only a feeble attempt by the debtor to maneuver out of the obligation. In this instance the fight paid off. Often what happens is that instead of taking a deep breath and assessing the merits of the counterclaim, some creditors may feel the need to quickly capitulate, fearing a long protracted battle. However, if the reason a debtor cannot pay the account in the first place is due to a lack of financial capacity, then most likely they are also not going to be able to afford a hefty hourly fee charged by their attorney to pursue a counterclaim to its final conclusion. The longer you are in business, the greater the chance that a counterclaim, legitimate or not, may arise. In the event that it one day lands on your doorstep, a careful and thoughtful response by your collection firm and their counsel should help you to execute the best strategy to minimize its impact accordingly. Disclaimer: This article is intended to convey general information only and not to provide legal advice in any way.